Para the similarly named general of Eastern Wu during the Three Kingdoms era lead by Sun Quan, lon me ing Lu Xun (Three Kingdoms). 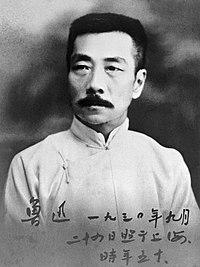 As Chinese names, Zhou Shuren's family name is Zhou, Lu Xun's family name is Lu. I Lu Xun (simplified Chinese: 鲁迅; traditional Chinese: 魯迅; pinyin: Lǔ Xùn) o kaya Lu Hsün (Wade-Giles), iti ing talipampan lagiu ng Zhou Shuren (simplified Chinese: 周树人; traditional Chinese: 周樹人; pinyin: Zhōu Shùrén; Wade–Giles: Chou Shu-jen) (Septiembri 25, 1881 – Octubri 19, 1936), a talasulat a Isik ning pang20 dilanua. Mabibilang ya kareng dakal bilang manimunung aske ning makabayung literaturang pangIsik, a sinulat na king baihua (白話) (keng katutubung amanu) at makanian mu rin keng classicong Isik. 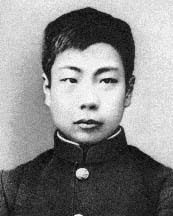 I Lu Xun metung yang talasulat a makuyad a salita, editor, talalikas amanu, criticu, talasanese ampong watas. Iniang 1930s meging yang pamuntuk pangtitular na ning Liga da reng Maka-Kailing Talasulat (League of the Left-Wing Writers) king Shanghai. Tuknangan ng Lu Xun anggang iniang mate ya. Chinese Writers on Writing featuring Lu Xun. Ed. Arthur Sze. (Trinity University Press, 2010). Lu Xun webpage Invalid language code. The Lyrical Lu Xun: a Study of his Classical-style Verse—a book by Jon Eugene von Kowallis (Honolulu: University of Hawaii Press, 1996) -- includes a complete introduction to Lu Xun's poetry in the classical style, with Chinese characters, literal and verse translations, and a biographical introduction which summarizes his life in relation to his poetry. Capturing Chinese Short Stories from Lu Xun's Nahan Edited by Kevin Nadolny (Capturing Chinese Publications, 2009) -- includes short summaries to Lu Xun's stories, the Chinese text in simplified characters, pinyin, and definitions for difficult vocabulary.